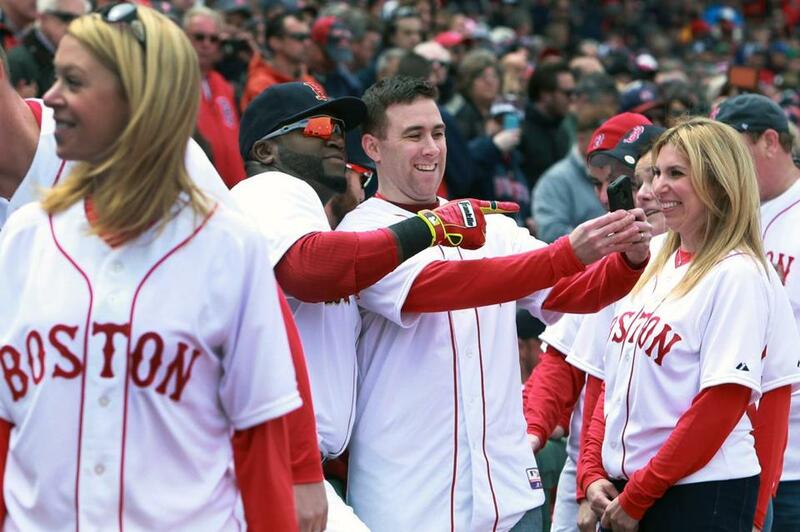 Richard Donohue posed for a selfie with David Ortiz as the Boston Red Sox received their World Series rings. A year after MBTA Transit Police officer Richard Donohue was shot in Watertown during a frenzied shootout between police and the Boston Marathon bombing suspects, he still receives outpourings of good will in even the most humdrum moments of his life. It’s been a long road for Donohue, 34, who sustained a wound that severed his femoral artery, causing him to lose so much blood that doctors were momentarily unable to find a pulse. Since then, his health has improved dramatically: He can walk without assistance, and he has become an ambassador for Marathon-related fund-raisers and philanthropic organizations. Last Tuesday, Donohue raised the flag at a memorial for Boston Marathon victims. Still, he grapples with dissonant emotions: He is grateful for the progress he’s made, but is frustrated that he is plagued by persistent pain and is unable to return to work. He is thankful for the support and assistance from strangers, but is growing weary of being a public figure. Donohue has no time frame for when he will return to work. He is not yet able to run, and the pain from his injury persists despite the benefits that have come from the intense physical therapy he has endured. “I remember telling people back then, ‘Yeah, I’ll be back in five or six weeks.’ I didn’t realize the severity of what had happened,” Donohue recalled. MBTA Police Chief Paul MacMillan said he is also optimistic about Donohue’s progress. Even without work, Donohue’s schedule is busier than ever, with physical therapy and family time sandwiched between a barrage of public appearances and media requests that have become a fixture in his family’s life. Marathon memorial events and fund-raisers. The One Run. A visit to the White House with the Red Sox and the team’s opening day. Blood drives around the state, which have become one of Donohue’s most beloved causes. Still, he said, it’s a challenging schedule to maintain. As he continues on his recovery, Donohue credits much of his progress to his son, now 18 months old — “He’s learned to crawl and walk and then run. I gotta keep up with that little guy,” he said — as well as his wife, Kim. Online, Donohue shares dispatches from his home life, and updates on his recovery. Donohue said he also receives support from his police department. He frequently sees buddies at the department and chuckles at their text messages and funny e-mails. “They check in on me,” he said. MacMillan, the MBTA police chief, declined to discuss what might happen if Donohue is unable to return to the force. “If he can’t come back for some reason, we’ll discuss that at some later time,” he said. Neither Donohue nor MacMillan wanted to discuss the possibility that Donohue was hit by friendly fire. Donohue was friends with Sean Collier, the Massachusetts Institute of Technology police officer killed last year, allegedly by the Marathon bombing suspects, in the hours before the Watertown shootout. Donohue says he has stayed in close touch with Collier’s family. “I can’t say that they’re doing well, really, because it’s such a terrible thing that happened. But they’re doing good — they’re doing things in his honor, and trying to bring about some good from a bad situation,” Donohue said. As he looks ahead, Donohue said his future isn’t clear.